DENVER (AP) — Michael Malone stopped when he saw Tim Connelly standing nearby and gave his boss a bear hug. Connelly returned the hug and congratulated his head coach. “That was awesome,” the Nuggets‘ president of basketball operations said. The players and coaches weren’t worried about catching the Warriors. They were enjoying the win and the climb from playoff purgatory to a budding title contender. “The first three quarters, we played pretty good. The last quarter, they got it going a little bit,” Kanter said. “We just need to learn to finish that fourth quarter. 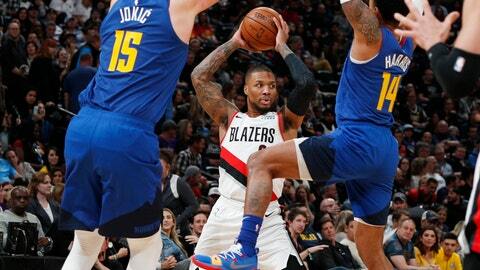 Portland led by three entering the fourth quarter, but Jokic set the tone in the fourth with seven quick points and fed Craig for a layup during an 18-6 run that gave Denver the lead for good. The Trail Blazers got within three on Kanter’s short jumper, but Murray hit a runner and Craig scored off of an offensive rebound to make it 114-107 with 1:12 left. Trail Blazers: G Seth Curry was ruled out before the game with left leg soreness. … Portland is 8-2 without CJ McCollum and 4-2 without Jusuf Nurkic. … Jake Layman’s three 3-pointers were two short of his career best. … Lillard’s first points came on a layup with 0.8 seconds left in the first half. Nuggets: The 33 home wins are the most since 2012-13 when they set a franchise record with 38. … Jokic now has 55 double-doubles this season. He has 12 triple-doubles, second to Russell Westbrook with 31. Craig’s teammates were quick to praise him after his performance, but when Murray was asked how tough Craig was to play against in practice, he couldn’t resist getting a jab in. Denver was 2 of 10 from long range in the first half and finished the game hitting 25.9 percent from 3-point range.